Chronic diseases are disorders of long duration and generally slow progression . They include four major non-communicable diseases (NCDs) listed by the World Health Organization (WHO)  - cardiovascular diseases, cancer, chronic respiratory diseases and diabetes - as well as other NCDs, such as neuropsychiatric disorders  and arthritis. As survival rates have improved for infectious and genetic diseases, chronic diseases have come to include communicable diseases (such as HIV/AIDS) and genetic disorders (such as cystic fibrosis). NCDs represent the major global health problem of the 21st century [4, 5]; they affect all age groups  and their burden is greater than that of infectious diseases. NCDs are the world leading cause of disease burden and mortality  and are increasing in prevalence and burden , even in low- and middle-income countries . Costs incurred by uncontrolled NCDs are substantial, especially in underserved populations  and low- and middle-income countries [10, 11]. NCDs are an under-appreciated cause of poverty and hinder economic development . Importantly, management of NCDs has recently been prioritized globally (Box 1). 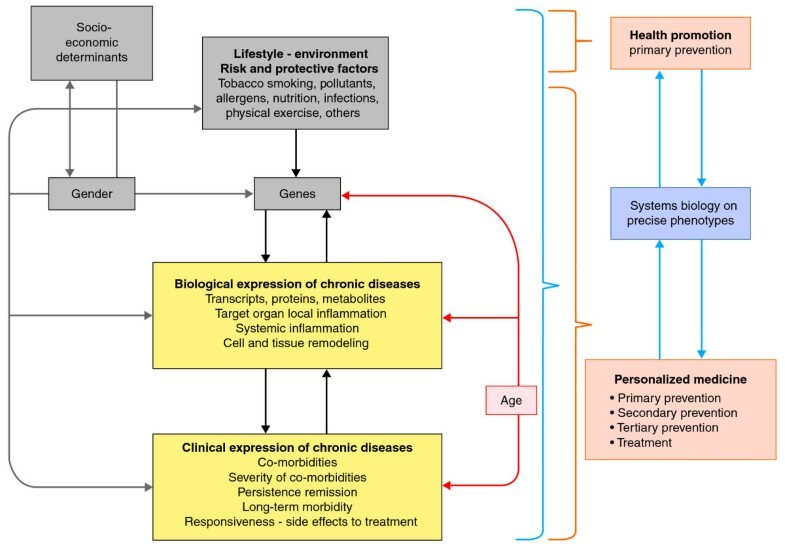 Chronic diseases are caused by complex gene-environment interactions acting across the lifespan from the fetus to old age (Figure 1). In this context, 'environment' includes risk and protective factors associated with environment and lifestyle, such as tobacco, nutrition, indoor and outdoor air pollution and sedentary life . NCDs are associated with complex gene-environment interactions modulated by socio-economic determinants, psychological factors, age and gender. The products of these interactions lead to the biological expression of NCDs and further to their clinical expression with co-morbidities. A new definition of NCD phenotypes is needed to understand how a network of molecular and environmental factors can lead to complex clinical outcomes of NCDs for prevention and control. May 2008: 61st World Health Assembly. WHO recommended a worldwide priority policy on NCD prevention and control (2008 to 2013), including cardiovascular disease, cancer, chronic respiratory diseases  and diabetes, not least because they often have common environmental risk factors . May 2010: United Nations (UN) General Assembly unanimously adopted Resolution A/RES/64/265: 'Tackling NCDs constitutes one of the major challenges for sustainable development in the 21st century' . December 2010: the Council of the European Union adopted conclusions based on innovative and global approaches for NCDs in public health and healthcare systems to further develop population-based and patient-centered policies . 2010: US Center for Disease Control and Prevention (CDC)  says that 'an essential strategy for keeping older adults healthy is preventing NCDs and reducing associated complications'. 19 September 2011: UN General Assembly symposium on NCDs. Socio-economic determinants are intertwined with the onset, progression, severity and control of NCDs. There are functional interdependencies between molecular components, reflecting complex network perturbations that link cells, tissues and organs . Early life events are crucial in the generation of NCDs, and aging increases disease complexity, adding, for example, tissue and cell senescence . Comorbidity refers to the co-existence of two or more diseases or conditions in the same individual that have similar risk factors and/or mechanisms. Most people with NCDs suffer from two or more diseases . Co-morbidity and multi-morbidity are common signatures of NCDs and are associated with worse health outcomes , complex pharmacological interventions and clinical management, and increased healthcare costs . However, little is known about how NCDs truly cluster at the genetic, molecular or mechanistic levels, and there is scant understanding of how specific combinations of NCDs influence prognosis and treatment . NCDs are multi-factorial. In addition to environmental factors and increased life expectancy, intrinsic host responses, such as local and systemic inflammation, immune responses and remodeling , have key roles in the initiation and persistence of diseases and co-morbidities. The recent increase in NCDs has been associated in part with biodiversity loss , socio-economic inequities linked with climate change, and loss of natural environments . A more comprehensive understanding of these links will make it possible to propose more effective primary prevention strategies. The in utero environment is an important determinant of adult NCDs, including diabetes , coronary heart diseases , and asthma  or chronic obstructive pulmonary disease (COPD) . Mechanistic links have been proposed that involve fetal expression of genes that are conserved across species, epigenetic mechanisms [22, 24], early and maternal life infections, and/or environmental exposures. These need to be understood better , as early interventions may have the potential to reduce NCD burden . Nutrition is a key determinant of health and NCDs. Understanding the underlying complexities of metabolic responses and pathophysiology is needed. Loss of biodiversity in food organisms causes micronutrient and vitamin deficiencies, and obesity and related chronic and degenerative diseases are a formidable challenge . Nutritional intervention in early childhood may help prevent autoimmune diseases , and adoption and adherence to healthy diet recommendations are needed globally to prevent the onset and facilitate control of NCDs . However, trying to change lifestyles using public health efforts remains a major challenge, and an interdisciplinary social and behavioral approach, including the cultural aspects of nutrition, is needed . Tobacco use , biomass fuel combustion and air pollution  are among the major risk factors for NCDs; these act as early as in utero and in early life. Those working on the global prevention and control of NCDs should consider these risk factors because translational epidemiology is the key to exploring their role in the development of NCDs and to devising approaches that will enable successful guided interventions . The development of a society, rich or poor, can be judged by the health of its population, how equitably health is distributed across the social spectrum, and the degree of protection provided to people who are disadvantaged by illness. Effective action against NCDs needs to include understanding of the social and economic determinants and their modification (Figure 1) . Indeed, best-practice interventions targeted at coronary risk factors eliminate most socioeconomic differences that affect coronary heart disease mortality, and this should serve as an example to follow for other NCDs . In May 2009, the 62nd WHO Assembly recommended re-orienting health systems globally to promote primary healthcare as the most cost-effective strategy . Healthcare often focuses on single diseases, advanced technology, biomedical interventions and specialist care. Most healthcare takes place in primary care settings , with emphasis on providing a complete range of care, from home to hospital, and on investing resources rationally. Fragmenting care can reduce the ability of primary care clinicians to ensure that patient care is comprehensive, integrated, holistic, and coordinated , and to decide whether a person has a significant disease or temporary symptoms . We recommend that, to determine measures of disease severity and control, effective interventions and studies should be built around carefully phenotyped patients (Figure 2) and strictly follow carefully crafted methodological standards. Patients should be placed at the center of the system; if they are aware of and understand the resulting phenotype data, their health will benefit. We stress that patients must understand that it is their societal responsibility to make their anonymized data available to appropriate scientists and physicians so that the latter can create the predictive medicine of the future that will transform the health of their children and grandchildren. For patients to adopt this approach, it is essential that laws be passed protecting them against abuse of their personal data by insurance companies, health authorities or employers. This approach to patient-centeredness, if aided by community health teams, will advance research. It may also benefit from the experience gained in patient-centered medical homes [40, 41]. 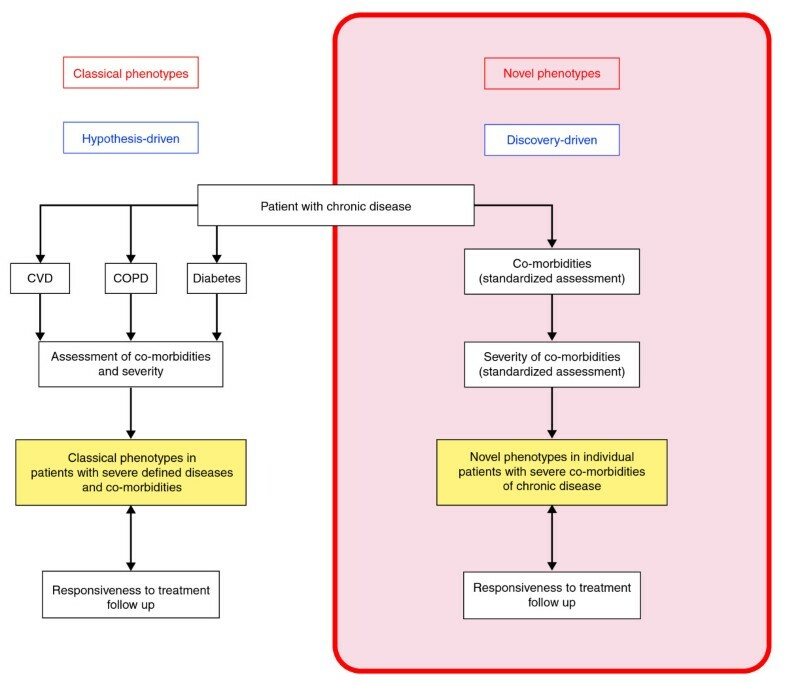 Classical phenotypes are based on a priori ontologies (cardiovascular disease, chronic obstructive pulmonary disease (COPD) and type 2 diabetes), and new phenotypes are based on statistical modeling of all the complex components of NCD onset, persistence and prognosis. The concepts of severity, activity, control and response to treatment are linked. Severity is the loss of function in the target organs induced by disease and may vary over time; as it may also vary with age, this needs to be regularly re-evaluated. Activity is the current level of activation of biological pathways causing the disease and the clinical consequences of this activation. Control is the degree to which therapeutic goals are being met . Responsiveness is the ease with which control is achieved by therapy . Control can be achieved using clinical and/or biological end points, such as glycemic control in diabetes . Careful monitoring of co-factors, such as compliance, and of unavoidable risk factors is needed. 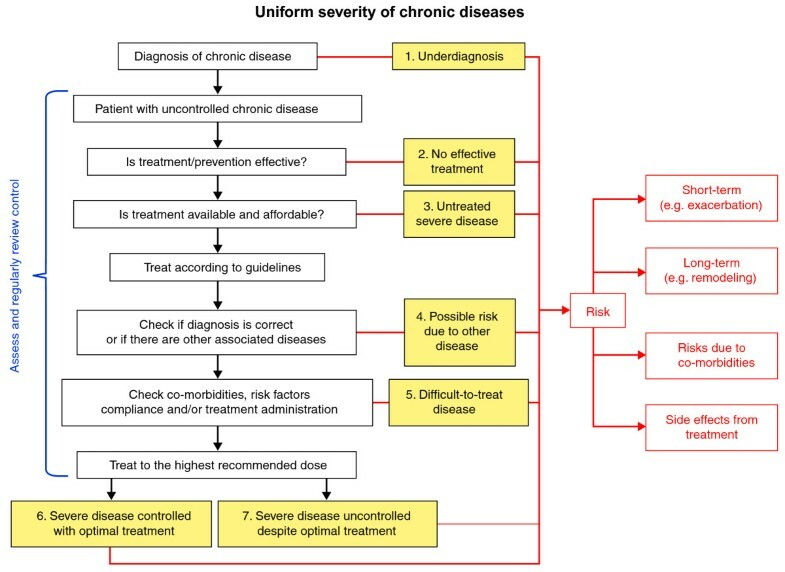 The uniform definition of severe asthma presented to WHO is based on this approach  and therefore provides a model to assess NCD severity (Figure 3). The concept of a uniform definition for NCD severity is based on control, responsiveness to treatment and risks (short, medium and long term). A single flow chart is proposed to define severity to improve phenotype characterization for all purposes (research, clinical and public health). It is based on diagnosis, therapeutic interventions and their availability/affordability, risk factors and co-morbidities. Information and communication technologies (ICT) are needed for the implementation of integrated care in a systems medicine approach to enable prospective follow-up of the patients. Home telemonitoring is promising  and should be explored further because continuous and precise monitoring makes each individual clinical history a valuable source of comprehensive information. More user-friendly and efficient ICT platforms are needed that include shared decision making, the process by which a healthcare choice is made jointly by the practitioner and the patient . Ideally, an innovative patient management program would combine ICT, shared decision making and personalized education of the patient (and caregiver) about multidisciplinary approaches. The content, acceptance and effectiveness of such approaches should be tested to ensure that the autonomy, quality of life and capacity of patients are respected and enhanced, and that their values and preferences dominate decision making . Practice-based inter-professional collaborations is also key to improving healthcare processes and outcomes . Qualitative assessment will provide insight into how interventions affect collaboration and how improved collaboration contributes to changes in outcomes. Thus, we propose that NCD management should move towards holistic multi-modal integrated care, and multi-scale, multi-level systems approaches. To reduce their socio-economic and public health impacts, we propose that NCDs should be considered as the expression of a continuum or common group of diseases with intertwined gene-environment, socio-economic interactions and co-morbidities that lead to complex phenotypes specific for each individual. The 'systems medicine' concept, which takes a holistic view of health and disease, encapsulates this perspective. Systems medicine aims to tackle all components of the complexity of NCDs so as to understand these various phenotypes and hence enable prevention (Box 2), control through health promotion  and personalized medicine , and an efficient use of health service resources . It does this through integrated care using multidisciplinary and teamwork approaches centered in primary and community care , including the essential ethical dimension. The main challenge regarding NCDs in the 21st century is to understand their complexity. Biology and medicine may be viewed as informational sciences requiring global systems methods using both hypothesis-driven and discovery-driven approaches. Systems medicine is the application of systems biology to medical research and practice [54, 55]. Its objective is to integrate a variety of data at all relevant levels of cellular organization with clinical and patient-reported disease markers. It uses the power of computational and mathematical modeling to enable understanding of the mechanisms, prognosis, diagnosis and treatment of disease . It involves a transition to predictive, preventive, personalized and participatory (P4) medicine, which is a shift from reactive to prospective medicine that extends far beyond what is usually covered by the term personalized medicine [57, 58]. It incorporates patient and population preferences for interventions and health states by implementing effective societal actions  with an important public health dimension . It is likely to be the foundation of global health in the future (Box 3). Primary prevention: to avoid the development of disease. Secondary prevention: recognize a disease before it results in morbidity (or co-morbidity). Tertiary prevention: to reduce the negative impact of established disease by restoring function and reducing disease-related complications. Universal prevention addresses the entire population (for example, national, local community, school, and district) and aims to prevent or delay risk factor exposure. All individuals, without screening, are provided with information and skills necessary to prevent the problem. Selective prevention focuses on groups whose risk of developing problems is above average. The subgroups may be distinguished by characteristics such as age, gender, family history, or economic status. Indicated prevention involves a screening process. According to these definitions, health promotion  should be used for primary universal and selective prevention strategies, whereas P4 medicine (predictive, preventive, personalized and participatory)  should be used for primary, secondary and tertiary indicated prevention strategies. Thus, there is an urgent need for development of information management systems that can enable secure storage of heterogeneous data, including clinical data, and provide tools for the management, search and sharing of the data. Such information needs to accessible, shared between investigators, queried, and integrated in a controlled and secure manner with molecular profiles and images obtained from high-throughput facilities. For example, one prediction arising from considerations of the evolution of P4 medicine suggests that, in 10 years or so, each patient will be surrounded by a virtual cloud of billions of data points; we will need information technology to reduce this staggering data dimensionality to simple hypotheses about health and disease for each individual patient . A systems biology approach that is unbiased by old classification systems can be used to find new biomarkers of co-morbidities, disease severity and progression. In this approach, phenotypes of NCDs are analyzed in an integrative manner using mathematical and statistical modeling, taking all diseases into account, and embedding co-morbidities, severity and follow-up of the patients through analyses in dynamic models (Figure 4). Unknown phenotypes are defined and further analyzed using iterative cycles of modeling and experimental testing. Novel biomarkers are identified combining datasets from genomics, epigenetics, proteomics, transcriptomics, metabolomics and metagenomics. These new complex biomarkers will need to be validated and replicated in independent controls or prospective patient cohorts . Using methods used in non-medical complex model systems, it should be possible to monitor 'early warning signals', which predict the state of disease progression, and the occurrence of abrupt phase transitions (slowing down, increase in autocorrelation and variance) . For example, in a mouse model of neurodegenerative disease, blood biomarkers have been shown to allow pre-symptomatic diagnosis and analysis of the stage of disease progression . Iterative mathematical modeling to increase knowledge on NCDs. 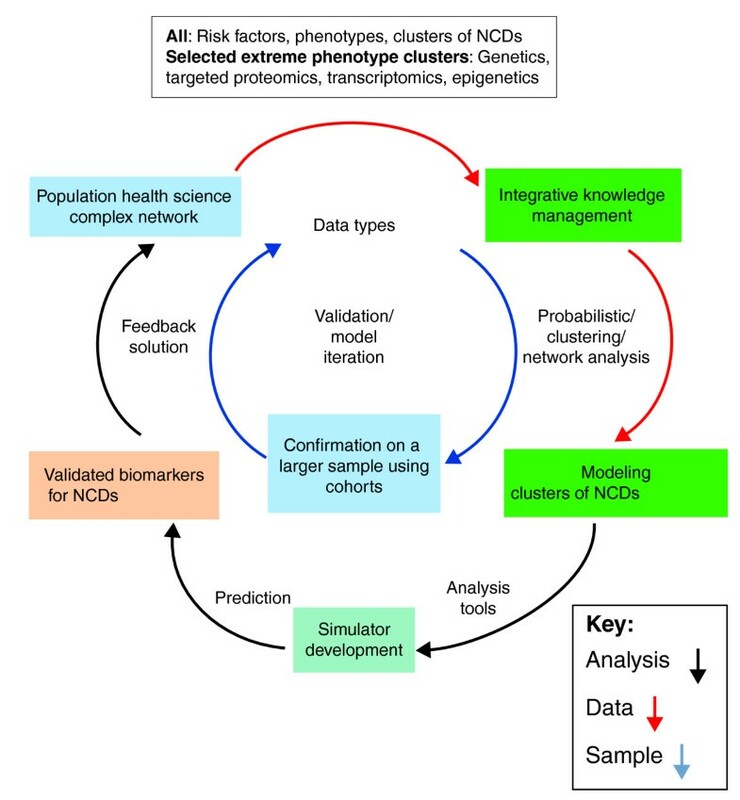 Various targeted or comprehensive data types are collected from samples of individuals with carefully defined phenotypes, processed using probabilistic and network analysis tools, and integrated into predictive models using a knowledge management and simulation platform, leading to the refinement of the classification of NCDs. Mechanistic hypotheses and complex biomarkers of NCDs generated through this process are then tested and validated iteratively using small then large cohorts of independent samples, providing potential diagnostic and therapeutic solutions for the general population. To detect and diagnose disease at an early stage, when it can be controlled effectively. To stratify patients into groups, enabling the selection of optimal therapy. To reduce adverse drug reactions through the predictive or early assessment of individual drug responses and assessing genes leading to ineffective drug metabolism. To improve the selection of new biochemical targets for drug discovery. To reduce the time, cost, and failure rate of clinical trials for new therapies. To shift the emphasis in medicine from reaction to prevention and from disease to wellness. Modeling is a powerful tool for reducing the enormous complexity of comprehensive biological datasets to simple hypotheses. Modeling of the temporal behavior of disease read-outs at short  or long  intervals can identify sub-phenotypes of NCDs. Attempts to find novel biomarkers of disease development using a systems biology approach have been used to assess the mechanisms of severe asthma, allergy development  and cancer. One important role that biomarkers will have is to stratify a given disease into its different subtypes so that appropriate and distinct therapies can be selected for each subtype. Phenotypes can be modeled using statistical approaches, such as scale-free networks and Bayesian clustering models, that are based on the evaluation of NCDs as a whole, taking into account co-morbidities, severity and follow-up. This approach will make it possible to find intermediate phenotypes and patient-specific phenotypes. The challenge will be to develop efficient, automated and integrated workflows that predict the most suitable therapeutic strategy not only at the population level but, most importantly, at the individual patient level. Bioinformatics, medical informatics and their interplay (sometimes termed biomedical informatics) will be key enablers in structuring, integrating and providing appropriate access to the enormous amount of relevant data and knowledge [66, 67]. Medical informatics needs to provide ubiquitous and powerful electronic healthcare record technologies to securely aggregate and handle diverse, complex, and comprehensive data types . Biomedical informatics must develop ways to use these content-rich electronic healthcare records to provide advanced decision support that considers all aspects of normal and disease biology, guided by clinically relevant insights and biomarker discovery research strategies [69, 70]. Bioinformatics will need to constantly restructure and refine global data to distill the clinically useful elements and the derived models, so they can feed this information system in a real-time, automated fashion, constantly incorporating clinical expertise. P4 medicine is evolving so rapidly in its understanding of disease states that the individual patient's data must continually be re-examined so that new insights into the health and disease state of the individual can be gained. This general informatics framework, based on an advanced ICT infrastructure, will provide the basis for empowering P4 medicine. Given the complexity of NCDs, bio-clinical scientific progress will depend critically on large-scale pooled analyses of high quality data from many biobanks  and bio-clinical studies (such as BioSHaRE-EU ). Biomedical informatics and knowledge management platforms have made significant advances towards enabling the development of technologies to organize molecular data at the level required for the complexity of NCD data [73, 74]. Data analysis, integration and modeling require strict statistical procedures in order to avoid false discoveries . They can be performed, for example, using the joint knowledge management platform of European Framework Program 7 (EU FP7) projects, including U-BIOPRED , MeDALL , AirPROM and SYNERGY-COPD, and using similar initiatives worldwide. Large-scale profiling to discover early markers of disease progression before the appearance of any symptoms has already been performed in a large prospective human cohort [77, 78]. Complementary approaches using computational models that extend existing models derived from the Physiome project, including biomedical imaging, can be used together with statistical modeling of various types of clinical data to further define phenotypes and develop predictive models. These can be used within the framework of a fully integrated (preferably open source) knowledge management platform . Such a platform for knowledge management, including annotation and ontologies, would then operate on top of the medical informatics infrastructure, setting the stage for a systems medicine approach to NCDs. In our collective experience these necessary aspects of medical informatics have a tendency to be overlooked in funding efforts targeting complex diseases. Integrated care, a core component of health and social care reforms, seeks to close the traditional gap between health and social care . Population health sciences should integrate personalized medicine in public health interventions to prevent and manage NCDs in a cost-effective manner by involving all stakeholders, including patients . The objectives of this proposed integration are: (i) to investigate questions related to NCDs; (ii) to improve the quality of primary care; and (iii) to widely disseminate new information that will improve overall health at both a local and national level . Chronic diseases can disconnect individuals from their usual milieu, with negative implications for physical, social and mental well-being. Moving beyond the disease-by-disease approach to tackle NCDs demands an improved understanding of NCD by patients, and a better understanding of their common causes. At the local level, strategies such as community oriented primary care can link and reinforce personal and public health efforts . To understand, preserve and improve the health of human populations and individuals, an integrated research strategy should include all components of research on NCDs and be integrated for optimal patient management [84, 85]. Careful evaluation is needed of: (i) the acceptance of multi-morbidity of NCDs by the patient, with particular attention to cultural and social barriers, gender and age; (ii) the engagement of patients in decisions regarding management , research and clinical trials [55, 57]; and (iii) the improvement of quality of life that would result from the proposed management. Targeting NCDs and their comorbidities will directly affect healthy aging, which has been described as a 'keystone for a sustainable Europe' . Screening, early diagnosis, prevention and treatment of hidden comorbidities in patients with diagnosed NCDs will reduce their morbidity and increase healthy life years. The direct and indirect costs of uncontrolled NCDs are substantial for the patient, the family and society, especially in underserved populations . P4 medicine should be put into the context of health economics to show that expensive strategies are cost-effective [55, 57]. Chronic diseases place a considerable economic burden on the society and increase inequities. The social dimension of NCDs needs to be pursued in the economic and employment fields. The net social benefit of improving medical and social care related to NCDs should take co-benefits into account. Health costs for NCDs should be balanced with health benefits, wealth creation and economic development. The management of NCDs requires the coordination of stakeholders in the public and private sectors within a governance framework that includes networks of care. Therefore, research should be done to identify social determinants and to create public health systems that translate efficacy into effectiveness in the community . Moreover, strengthening health equity across nations and socioeconomic groups is needed to meet the ambitions of the Commission on Social Determinants of Health, who have proposed closing the health gap between nations and groups in a generation . Values are the basis of most actions in health and the economy, and these values are often not made explicit. Changing paradigms and approaches to NCDs may challenge fundamental societal values and professional habits [59, 90]. The apparent contradiction between the development of a more tailored medical approach to NCDs and the public health dimensions of their prevention and care needs to be addressed using a value-based analysis. Thus, a thorough analysis of values underlying P4 medicine should be conducted in diverse contexts and should become part of the basis of decision-making. The respective weight of the multiple stakeholders involved in the priority setting must be made clear, with transparency and proportionality as key features. P4 medicine development should be a global aim and not a privilege of 'rich' countries. Using data obtained from all components of research, guidelines on NCDs applicable to primary care could be developed using up-to-date methodology [91, 92]. Policies for implementation could then be proposed, to translate the concept of NCD into practice. They should distribute the burdens equitably, also considering gender and age. Multidisciplinary training of all stakeholders, with particular emphasis on the participation of patient associations, is a further essential component. Many health and non-health professionals need to be educated in the general approach to the research and management of patients with NCDs. Innovative training programs using ICT will be essential in this implementation. Such education will also need to address questions of how to teach the subject and how people learn it, rather than merely regarding education as a process of transmission and transaction for everyone involved. This includes taking into account points of view, habits of mind, and all the information requested for the needs of the strategy. The educational program needs to forge educational systems to help participants think in a coherent way about NCDs. A module of the program should be developed around patient feedback to help them be engaged in all aspects of NCDs, including research. Many patients with NCDs live in developing countries where medications and services are often unavailable or inaccessible. Effective medications, such as inhaled corticosteroids for asthma  or insulin for diabetes, should be made available for all patients . In addition, there should be a global cost-effective application of P4 medicine across the world . It is likely that genomic applications and ICT will become available to many developing countries at a relatively low cost in the next few years. In addition, new private-public strategic partnerships, such as the pre-competitive Innovative Medicines Initiative, a joint undertaking of the European Union and the European Federation of Pharmaceutical Industry Associations , and the Program on Public-Private Partnerships of the United States National Institutes of Health Roadmap , are required to overcome the bottlenecks in the development of new treatment strategies . WHO actively supports capacity building, especially in developing countries, fosters partnerships around the world, and works to narrow the gap in healthcare inequities through access to innovative approaches that take into account different health systems, economic and cultural factors. Despite the growing consensus for the need for health system strengthening, there is little agreement on strategies for its implementation . Widely accepted guiding principles should be developed with a common language for strategy development and communication for the global community in general  and for NCDs in particular. NCD management needs to move towards integrated care, global strategies and multi-modal systems approaches, which will reduce the burden and societal impact of NCDs. To this end, we propose that NCDs must be considered as the expression of a common group of diseases with different risk factors, socio-economic determinants and co-morbidities. This will enable the application of P4 medicine principles to NCDs, exploiting their commonalities, bringing improved global healthcare and the reduction of inequities around the world. The expected results targeted to better support for patients include: (i) better structuring of translational research and development for NCDs; (ii) greatly enhanced prevention and treatment capabilities; (iii) innovative healthcare systems with implementation of follow-up procedures directly in the homes of patients; (iv) slowing down of health expenditure increase; and (v) new interdisciplinary training curricula. Part of the conceptual work presented has received support from the European commission FP7 projects AIRProm (Grant Agreement FP7 270194), BioSHaRE-EU (Grant Agreement FP7 261433), MeDALL (Grant Agreement FP7 264357), SYNERGY-COPD (Grant Agreement) and U-BIOPRED (Grant Agreement IMI 115010). JB, JMA, AC-T, FK, MLK, SP, CP and CA were supported by MeDALL; PJS, IMA and KFC were supported by U-BIOPRED; JR and AA were supported by SYNERGY-COPD; CB was supported by AIRProm; AC-T was supported by BioSHaRE-EU. The positions, proposals and ideas expressed in this paper have been discussed by several authors (CA, ZC, LH, AB, JB, AC, SA, DC, DN) during the inaugural event of the European Institute for Systems Biology and Medicine of the Systemoscope International Consortium at the Biovision World Life Sciences Forum in Lyon on 28 March 2011. The authors declare that they have no competing interests in relation to the content of this article.